"THE CRIMSON RIVERS (Les Rivieres Pourpres)"
The chilling atmosphere may not come across as powerfully on the small screen, but this movie still bests its Hollywood brethren. If the play-by-their-own-rules cops in "The Crimson River" weren't speaking French and driving those little tin can police cars, it would be hard to distinguish this murder-mutilation psycho thriller from a Hollywood production starring, say, Morgan Freeman. Taking atmospheric cues and unnecessarily lingering close-ups of corpses from American genre high-water marks like "Seven" and "Silence of the Lambs," writer-director Mathieu Kassovitz seems to be using the movie to angle for a Tinsel Town job offer. He shows off his action scene abilities with a seat-gripping car chase and a barely-in-context kickboxing fight. He sidesteps plot loopholes like a pro. He offers up comic relief sidekicks. But at the same time he spins a complex and exponentially tense mystery that inspires the audience to wrack its brain along with the heroes to put together the clues before the killer strikes again. 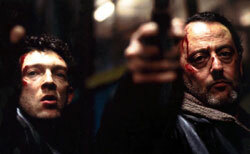 Said heroes are Jean Reno ("Ronin," "The Professional") and Vincent Cassel ("Elizabeth," "The Messenger"), a Paris detective and a local cop whose investigations collide in a string of gruesome murders dripping in symbolic suggestion and apparently connected to the private university in a quiet mountain town where the locals have become plagued by inexplicable birth defects. The killing victims are all second- or third-generation university personnel, they've all had their hands cut off, and some have had much worse done to them by way of offering the detectives an esoteric trail of evidence leading to other bodies and to a much more chilling discovery down the road. Scruffy, hard-edged Reno begins the film investigating the torture killing of a student whose father teaches at the university. His body is found hanging from a snowy cliff by a beautiful but surly mountain-climber (Nadia Fares) who seems to have a nebulous connection to the later killings as well. Scruffy, handsome Cassel comes into the case while looking into a neo-Nazi desecration of a mausoleum for a little girl who died in 1982 in a horrible high-speed traffic accident. The same day that little girl's 20-year-old records were the only items stolen during a burglary at the local elementary school. Their paths cross when Cassel zeroes in on a suspect who becomes the most recent victim of the killer Reno is chasing. As they compare evidence, the riddle of the murders becomes even more cryptic (there are allusions to the supernatural), the clues even more bizarre (30-year-old acid rain in a victim's eyes leads Reno to find another body by rappelling into a glacier), and the only thing that becomes clearer is that something aberrant is going on at the incestuously-staffed university. Kassovitz does such an exhausting job of swelling the ever-more-invasive tension throughout "The Crimson Rivers" that even something as simple as the discovery of the missing school records feels like a startling development -- even though you haven't the foggiest idea what it means yet. Such effects are aided by the sumptuous photography (by Thierry Arbogast) in dark, rich, icy colors that help give the film a claustrophobic feel, and by the consistently portentous score (by Bruno Coulias) of unsettlingly soft but crisp strings and bass. As the puzzle comes together for a dizzying shocker finale, you can start to see where there are a few pieces missing. The big picture may also strike some as a little absurd, but it's certainly no more preposterous than the conclusions of recent Stateside cops-vs.-psycho flicks, like "Along Came a Spider" or "Hannibal." Ultimately that is the only real problem with "The Crimson Rivers": In aspiring to be just like Hollywood fare, it aims too low.